The South African currency is the Rand. We have pictures of our Big 5 on our notes. Buffalo, Lion, Elephant, Rhino and Leopard. They come in bright colours – red, blue, green, orange and yellow. And they vary in size. It’s not easy to mix up one’s money here. South Africa has high interest rates by world standards. Our prime rate is 10%. This could be why the Rand is actually strengthening at the moment while other currencies are floundering. It’s hard to owe money here and there is some incentive to save. For the interest and exchange rates go to our Reserve Bank website. Click here – South African Reserve Bank. Shopping and eating out are still very affordable for visitors. 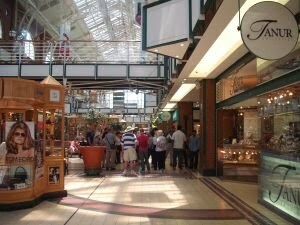 We have the usual shopping malls with luxury and budget items for sale. I prefer the markets and shops with vintage and old items that are unique. Those type of stalls are found in Long Street, Salt River, Observatory and St James area.